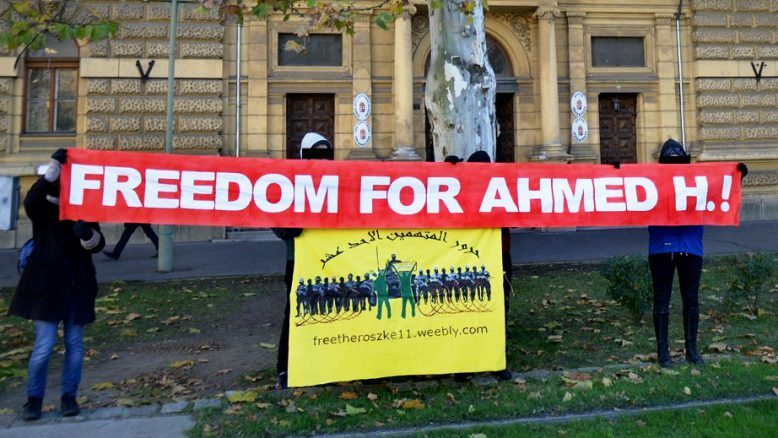 Startseite »Events»Freedom for Ahmed H.! On Wednesday, Ahmed H., was sentenced after a series of extremely biased trial hearing to 10 years of prison for “terrorism” and “illegal border crossing” in the court of Szeged. Ahmed H. is Syrian and lived with his family in Cyprus, until he travelled with his parents along the Balkan route to support them on their journey to Germany where they wanted to find international protection. He was arrested together with 10 other people a bit more than a year ago, shortly after the 15th of September 2015, when the Hungarian government closed its border with Serbia. When people were blocked without any support from moving on, they started to protest. The situation got increasingly tense until it escalated and police started using tear gas and water cannons and protesters were throwing stones. Ahmed H., was among those who communicated with a megaphone between the crowd of protestors and the police, tried to calm both sides down and later also started throwing stones. That he was using a megaphone and throwing three stones, was the argument of the court that he was the leader of the protest and that he was “threatening the Hungarian state” = terrorism. The trials were nothing but an absurd show trial: the court continuously equated Ahmed’s religion Islam with terrorism, most of the witnesses were police men and all independent witnesses like journalists, volunteers at the border were rejected as witnesses, together with other material that would have helped to prove Ahmed’s role at the border. Ahmed’s trial (and the trials of the other Röszke 11), together with the fence, the police violence and the harsh policy changes are supposed to state an example and create an atmosphere of fear. They are part of the Hungarian state’s increasing racist propaganda against all migrants, especially Muslims and part of the repressive migration policies. We will start at 16.00 at Blaha Lujza tér and march to Madach tér. Bring banners and things to make noise with! Let’s protest against the injustice of the court, equating Islam with terrorism; and sentencing without evidence! Let’s protest against the political use of the terrorism paragraph to spread hatred and fear in Hungary! Let’s protest for the freedom of Ahmed H.!